Here are some information about lines connecting Naples Airport Capodichino and the city center. Alibus connects Naples International Airport to the railway station in Piazza Garibaldi and the Port in Piazza Municipio. The ride from the Airport of Naples Capodichino to Salerno and vice versa takes about 65 minutes. The rides are made from Friday to Saturday, excluding Sundays and holidays. The ticket, which costs about € 4.00 each way, can be purchased directly on board. The departure from Naples is in the departure area (see the map at the top of the page). In Salerno will be done 5 different stops. Download here pdf timetables: Capodichino-Salerno (last update 25/01/2016). See the line to Battipaglia. See the line to Serre. The ride from Naples Airport to Sorrento takes about 75 minutes; the buses run every day, holidays included. The departure from Naples’ Airport is in the departure area and tickets, costing € 10.00 per way, can be purchased on board. There are 8 rides per day; the first leaving at 09:00 and the last leaving at 19:30. AIR connects Naples Airport and Avellino Piazza Kennedy. It spends about one hour. The first departure from the Airport is at 05:50, the last around 23:40. One departure about every hour. Dowload here pdf timetables EAV Naples Benevento. To reach Benevento by train you have to go in Naples Central Station. Dowload here pdf timetables Cosat Napoli Battipaglia. It pass through Salerno. Dowload here pdf timetables ATC Napoli Caserta Capua. Dowload here pdf timetables CSTP Napoli Salerno Battipaglia Eboli Serre. Dowload here pdf timetables Liscio Capodichino Potenza. It costs 8.10€. Can you please advise if there is any public transport service from Naples Airport to Furore? Here the timetable of the buses which stop to Furore. Hello – can you assist with details on bus travel from the Amalfi Coast to Rome in July please? How to reach the Santa Caterina Hotel , should I take a taxi from the shuttle bus ? Where is Santa Caterina Hotel? Is this the hotel that you booked? Can you please tell me if there is a bus from napoli airport to maiori during the summer? Thank you. I’m impressed, I ought to say. Seriously rarely do I encounter a blog that’s both educative and entertaining, and let me tell you, you’ve got hit the nail on the head. Your notion is outstanding; the problem is something that not enough people today are speaking intelligently about. I am extremely happy that I stumbled across this in my search for something relating to this. Can you please tell me how to get from Praiano to Sorrento’s Marina Piccola port? If you can also advise how long it will take and how much it will cost please? And what time is starts in the morning? Perchè non riesco più a trovare nel sito gli orari A/R del collegamento Na aeroporto – Salerno? Me li potetet pf comunicare? La corsa dall’ Aeroporto di Napoli Capodichino per Salerno e viceversa ha una durata di circa 65 minuti. Le corse vengono effettuate dal venerdì al sabato, escluso domeniche e giorni festivi. Il biglietto, dal costo di € 4.00 per tratta, può essere acquistato direttamente a bordo. Would you please tell me how to get from Naples airport to Praiano? thanks! Here attached the timetables for the bus from Sorrento to Praiano. Could someone tell me how to get från Napoli Airport to Vietri sul Mare on a Fridag afternoon/evening (5 pm).? Our flight arrives at 4.15 p.m. How long does it take to get to Naples first? If we do not make it with the last bus at 6.30 p.m. is there any other way to reach Vietri or a village close by such as Salerno? Are taxis from the airport to Naples and around the Amalfi coast expensive? How much should we expect going from the airport to Naples and/or from Salerno to Vietri? To reach Naples there is a bus every 20 min from the Airport and shouldn’t take longer then 20/30 min. Maybe you can take a taxi from the Airport directly to the bus stop but from Naples to Vietri I suppose will be quite expensive. In any case, from Naples is really easy to reach Salerno, either by bus or by train. Many thanks again! This site and information was very helpful!!! Hi. I’m leaving Salerno on 23 July (Next Tuesday) . How can i go to Napoli airport from Salerno? 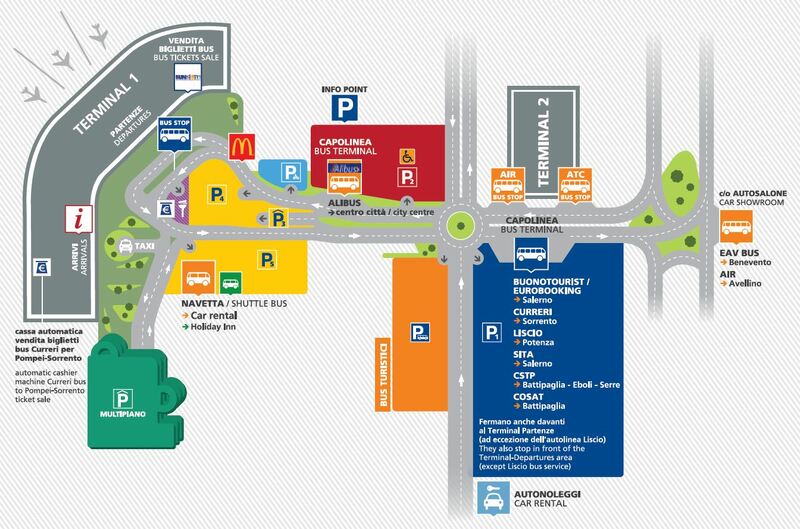 Can you tell me how best to Sixt Car Rental at Corso Garibaldi 45 in Salerno from Naples airport? Thank you for your help! Please is there a bus from naples port to sorrento? By ferry: from Naples Molo Beverello and once in Positano take the yellow Circumvesuviana buses to Sorrento central square. Please could you say me if there is a direct connection between Amalfi and Naples Capodichino? Thank you very much, but I have to go from Amalfi back to airport. I think, i have first go to Salerno and there to Capodichino. There is no direct connection? Thank you, I look forward to the costa amafitana! could do u please tell me how can I get any connection between Pontecagnano or Salerno to Naples airport ? Will a bus leave Amalfi at 22.00 hours on Tuesday, October 29, with destination Sorrento? Hello. I’ll be arriving at the Napoli airpot tommorow at about 17:00. I need to get to Amalfi (actually Ravello). Now, I did check all the timetables you provided and the only problem seems to be the link between the airport and Salerno. You mentioned the four departures at 09:30 – 13:30 – 16:00 – 19:30, but thy don’t match with this. Could you please enlighten me on which one is the right one that’s valid for tommorow? Hi, can you tell me how to get from Napoli city center to either Amalfi or Positano by bus without passing Sorrento? Is there a direct bus? I’ll go there this Nov 1. I am on the Buonocore Group to look at the bus schedule but there is only 9 and 13:00, in the post above you mentioned there are 4 buses? I arrive on Wed. 12pm. so the 13:00 will be too rush. How can I see the 16:00 bus? Also, is the Buonocore group different than the SITA bus? I saw above you gave the official time table and there is a 16:00 from NAP , is that the SITA bus? where can I take the SITA bus? Hi, at what time departures the first service from Sorrento to Napoles Airport? Curreri Viaggi offers a every-day line from Sorrento to Naples Airport. Is there a service via Salerno? Sundays there is only one bus. We would suggest you to get some kind of private transport/transfer or Taxi. I was just looking for some help.. I was wondering what would be the cheapest way of getting from Naples airport > Minori (on the Amafli coast) at around 5/6pm on a Sunday? Am I right to think it would be best to do: Naples > Sorrento > Amalfi > Minori? But We have to consider that you travel in a sunday afternoon. In this case you can go from Naples Airport to Sorrento with Curreri Viaggi bus company. I’m trying to get from Naples to Conca Dei Marini. I saw the timetable NAPOLI – CASTELLAMMARE – GRAGNANO – AGEROLA – AMALFI but noticed that there are doesn’t seem to be a bus that goes from Napoli to Conca without having to transfer buses, is this correct? Do the ”-” mean that the bus does not go that far? Is it easier/faster to go from Naples to Sorrento then Conca Dei Marini or Naples to Solerno then make my way back to Conca Dei Marini? Thank you Monica, your help is much appreciated! From Napoli, on the first link you included, at which stop would I need to change buses for Conca Dei Marini? I am looking for the latest time table from NAPOLI AEROPORTO CAPODICHINO to SALERNO and further to MINORI. Can you please help? I am arriving on Fr. July 18th around 16:30 at the CAPODICHINO and have to get to MINORI. Further I have to go from Minori to Castellamare. Could you please also post the latest time table? Last Sita bus from Capodichino to Salerno is at 16:00. 2) to take a Alibus bus shuttle from Capodichino to Naples Central Station (Alibus timetables) and to take a train from Naples to Salerno. That`s perfect! Thank you very much. We are arriving at Naples Airport on September 23 going to Salerno, Italy. Please let me know what bus to take from the airport at Naples directly to Salerno. Where do we get the bus from once we pick up our luggage at Naples airport. 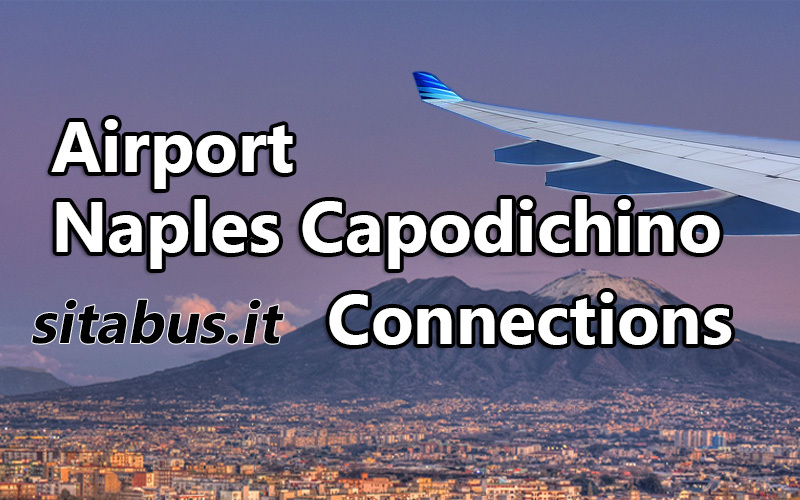 I would like to know how is best to get from Capodichino airport to the hotel Joyfull? Or Alibus and a means of transportation to the hotel? If the second option is better, you please tell me the bus number? I would like to spend the coming of new Year in Piazza Plebiscito, so please tell me if there is a way the transportation to work after the event (on January 1) and to take us to the hotel Joyfull? -from Naples at 18.48 and from Baiano at 19.02. -from Naples from 7.48 to 12.48 and from Baiano from 8.02 to 12.32. January 01, special train from Naples to Poggiomarino at 10.55. -from Naples to Nola at 10.48. I suggest you a private car or taxi. Thanks in advance for alllll your helpfull comments!!! According to the updated timetable, is the 1600 one the latest bus for Salerno from Naples airport? Which timetable would you suggest me for Sorrento bus (from Naples airport) in case we decide to start the trip from there? This tickets are considered in the Unico Costiera one for 3 days? If not, we pay them directly onboard, isn´t it? Do you know where in the airport we can get the Unico´s? CurreriViaggi manages line Naples Airport – Sorrento. There is a bus at 16:30. Unico Costiera is not valid for Naples Airport. There is an equivalent ticket named UnicoCampania (valid for Naples or for all Campania Region) for 3 days. Tickets can be purchased at bars, tobacconists and newsagents (SUN STORE DELLA CORTE SRL – tobacconists in Capodichino Airport). My friend and I need to know what bus goes from Naples Airport to Agerola, we need to get a bus from 6pm on Friday 1st May 2015 and returning from Agerola 3:30pm on Friday 15th May 2015. About May timetables, now it is too early. I would like to know if there are any buses from the Napoli airport to Minori? Or do I have to go to Salerno and then take the SITA bus to Minorri? Do you know how can I get from Capodichino to Castelgrande ? I will be a volunteer there this august and I have been unable to find any bus that gets me there. I have found some docs but when I try to find it in the liscio website I cannot find it and I do not know if it is correct for this year.